The Predator B is a larger and more powerful derivative of General Atomics Aeronautical Systems Inc.'s (GA-ASI) successful RQ/MQ-1 Predator multi-mission UAV. Development was begun as a private venture in 1998, but was eventually funded by NASA. The first flight of the prototype occurred in February 2001. The Predator B is essentially a scaled-up derivative of the RQ/MQ-1 Predator, the major difference in layout being the more conventional upward V-tail. GA-ASI has flown Predator B prototypes with two different powerplants, the first one with a Honeywell TPE-331-10T turboprop and the second one with a Williams FJ44-2A turbofan. The basic equipment suite of the Predator B is similar to that of the RQ/MQ-1 Predator, and the primary mission equipment consists of a Raytheon AN/AAS-52(V) MTS (Multi-Spectral Targeting System) EO/IR sensor turret/laser designator and a General Atomics AN/APY-8 Lynx SAR (Synthetic Aperture Radar). The Predator B can also be used as an armed multi-mission UAV, launching AGM-114C/K Hellfire missiles and other guided weapons. The Predator B is compatible with the ground-based communications equipment of the MQ-1B Predator system, so that it can supplement and/or replace the latter relatively seamlessly. After the U.S. Air Force had successfully "weaponized" its RQ-1 Predator, it became interested in the more powerful Predator B. In February 2003, the designation MQ-9A was allocated to the turboprop-powered variant of the Predator B (the USAF was not interested in the turbofan version), and later that year two YMQ-9A prototypes were purchased. These aircraft are being evaluated by the Air Force, and at least four additional more airframes have been delivered so far. Current orders cover at least 20 MQ-9 aircraft, and the planned total production is 60 airframes. The YMQ-9A has significantly higher performance than the original Predator. It has a mission endurance of 24 hours at a maximum altitude of 13700 m (45000 ft), and GA-ASI claims a total endurance of up to 30 hours. 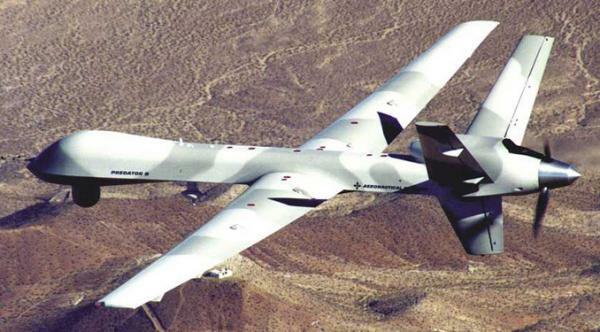 In 2006, the USAF assigned the official "popular name" Reaper to the MQ-9 UAV. Note: Frequently the designation MQ-9B is mentioned for the Predator B (or its projected production version). However, this designation is not yet allocated to any Predator B variant.